Inspiration for custom jewelry pieces can come from many different things. I have made custom pieces for clients using molds of furniture carvings, locks on antique desks, ornate doorbell plates, and lace from wedding dresses. 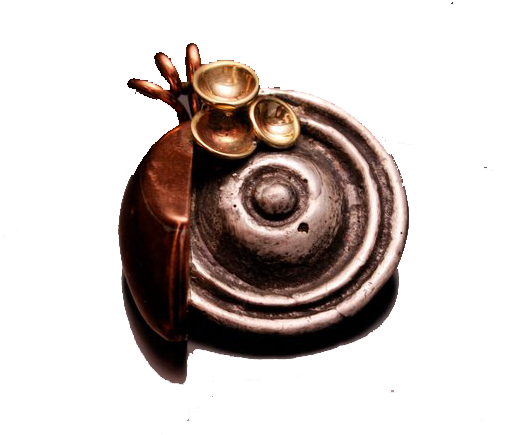 Virtually any three-dimensional object can be transformed into a piece of wearable art using the lost wax casting method. While going through a box of her great grandmother's lace, Dawn found two exquisite pieces that had been hand tatted by Ida Uhler. These fragile pieces of lace dated back to around 1900. 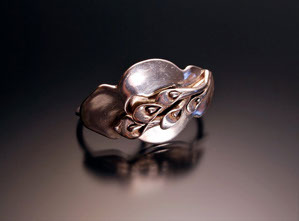 In order to preserve these precious mementos, I molded them in wax and created solid sterling silver pieces in their exact likeness. 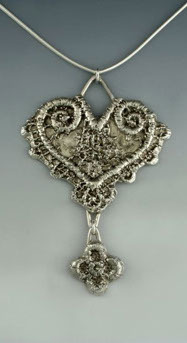 This heart pendant and lace cuff were sent to Dawn, along with the undamaged pieces of lace that she sent as inspiration. to downsize their home after they retired. dining room table and a settee. Bonnlyn had memories of sitting on that settee and listening to her mother read to her. As she sat there, she would run her hands along the carving on the arm. 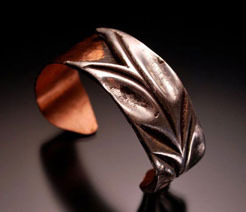 That carving helped me create this copper and sterling silver cuff bracelet. If you have been inspired by any of these pieces or stories, please fill out the contact form and send me a personal message. I would love to work with you to design a special piece of jewelry that will mean something to you or one of your family members. Because I am able to re-use molds, it is also possible for me to make duplicates of these pieces if you would like to gift them to multiple family members. December 20th, 2010 my Aunt Shelby's house was lost to a devastating fire. The contents of the home were a total loss. Family photos were gone and heirlooms were destroyed. Before the contents of the home were thrown away I took a mold of the lock that was on the front of the dining room hutch. It is that lock that acts as the foundation for this double ring. For some people, a particular piece of furniture brings back fond memories. That was the case for the client that ordered this cuff bracelet. 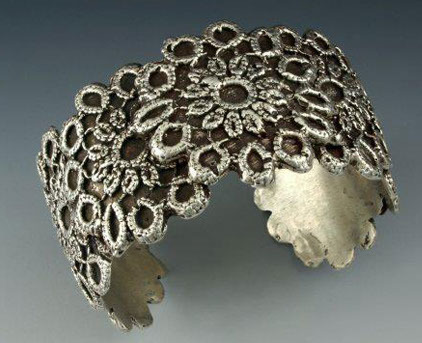 The bracelet was based off a mold of an ornate lock that was on the front of a roll top desk The desk dated back to 1898 and had belonged to her great grandfather Sheffey. 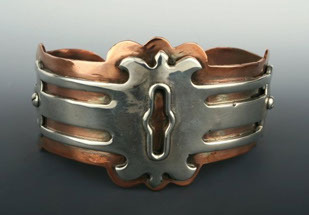 The sterling silver lock is layered on top of a solid copper cuff.